It is so nice to have "Wine Friends" that are as excited about wine as I am. Every week I am amazed at the number of people that visit my site and take the time to comment or make suggestions of wines to try. What started as a hobby, has become something more. Where this journey will end I do not know. I have to say, I am having a heck of a lot of fun on the trip. This week my friend and fellow wine buff Barbara Johnson dropped off a bottle of Montes Alpha Syrah and asked for my opinion. She and I have similar palates, so I was excited to give it a try. I am a fan of Chilean wines from way back. Initially it was because of their affordability more then their quality. Lately, it is more about quality. Their reasonable price is just icing on the cake. Montes Alpha is producing their wines with a trick learned from the Australians. They add a bit of Cabernet and Viognier to the Syrah, and the wine becomes better then the sum of its parts. This wine certainly does. With the addition of 7% Cabernet and 3% Viognier the wine is given some added structure and great aromatics. This wine is a smooth gem. It pours a dark ruby color and emits floral, tobacco and earthy aromas. There is also a hint of red fruit on the nose, but it is tough to isolate. The red fruit comes through when tasting. This full bodied syrah blend has berries and cassis galore, with leather and earth layers. This wine was aged for 12 months in French oak, and you can taste a bit of the oak on the finish. The wine has a nice mouth feel. Rich and hearty, you can feel the structure that the Cabernet has delivered in the blend. A slight floral note on the long finish gives a hint to the small amount of Viognier added before bottling. The tannins do not overwhelm. This is an easy bottle to drink as the tannins are mature and a bit velvety. It has nice balance from start to finish. Overall, this is a lovely bottle of wine. A different style and richness then the Australian Shiraz, this is a great wine for a hearty steak or stew. You won't be disappointed. Look for the 2005 vintage, it should be available now. Although this will lay down in a cellar for some time, it is a winner right now. I would not expect this to improve a great deal in the bottle. The Montes Alpha wines and many of their Chilean competitors have been improving in quality dramatically. A few have been included in top 100 wine honors, and are certainly worth a try. Don't hesitate to give these wines a look. Don't limit yourself to just the Syrah. They have Cabernet, Merlot, Pinot Noir and Chardonnay as well. For those who hurry...it can be found at Costco for about $18.00. Otherwise, it can be found at any good wine store for about $21.00. Thank-you Barbara for the great recommendation. Anyone that has some suggestions for future columns, or wants to submit a wine for review, please e-mail me! Pronounced "La Show Me Air", this French staple in Georgetown has swept me off my feet. Attending a wine dinner I was expecting the night to be all about the wine...."AU CONTRAIRE", this night was about the food AND wine which were paired to perfection. It took a bordeaux dinner to get me there. This dinner featured wines by Chateau Caronne Ste. Gemme and Chateau Clos Bourbon, two very fine "Petit Chateau's". I gathered a group of 10 "wine friends" to attend this event and together try and assess how good the 2005 vintage really is. LaChaumiere is owned by Patrick Orange and Martin Lumet. Patrick is Chef and Martin is host extraordinaire. They both spent time with the group making us truly feel at home. The accommodation in the upstairs dining room was a bit tight, but comfortable. More then one of us commented on how at home the decor made us feel. When describing Chefs, the term mechanic often comes into the conversation. A good chef is always a good mechanic. Knife skill, timing, coordination....all of these are important qualities. More important and intrinsic to success, especially in the hyper-competitive D.C. market, is artistry. This gift is rare, and only found in an elite corp of chefs, usually at the highest level. Patrick Orange convinced me at this dinner that he was truly an "artiste". Does this review leave you thinking that maybe I was impressed? I was. This restaurant will not be checked OFF my list, but left on my short list of favorite eats. They have a very nice, and reasonably priced wine list. They will also allow you to bring a special bottle from your cellar with a $25 corkage. How nice to still find this courtesy. To return the favor, be sure to order one off their list for each one you bring...it is the right thing to do. LaChaumiere Restaurant - Georgetown, D.C.
With the US dollar in free fall, trying to find a bargain in French wine is difficult. Especially for those with a penchant for Bordeaux. With the 2005 vintage being touted as one of the best of the century, many of us have been trying the wines from the lesser known "Petite Chateau's" to find an affordable favorite. With the wine press focusing so much attention on some of the smaller chateaus, Chateau Caronne Ste. Gemme is consistently a favorite. Last night, Francois Nony, a fourth generation proprietor of Caronne Ste. Gemme, came to DC to promote his wines. He spoke about the history of the Chateau, his family's love of the terrior, and the quality and staying power of his wines. We tasted wines from the 1990, 2000, 2003 and 2005 vintage. My favorites were the 1990 and 2003. I will focus on these in the interest of space, but rest assured, all were delicious. The 1990 surprised all of us with its resiliency. The 1990 when poured looked beautiful. A bit duller in color and showing a bit of browning at the meniscus, the wine still had lots of fruit. The wine also had layers of earth, mushroom and some smoke finishing with smooth tannins. The wine was a pleasure to drink. I am not sure how many more years this one has left, but at 18 years old...it is showing surprisingly well. This one came out of Francois Nony's personal cellar....Thank you Francois for the rare treat. 2003 was a year of drought in Bordeax. The vines were stressed, and the fruit highly extracted. The 2003 Caronne was a beautiful color, and the black fruit and briar assaulted your senses. It was somewhat fruit forward, with layers of fruit, herbs, and very low acidity. It was a bit astringent on the finish, but this characteristic should fade as it picks up a few years in the cellar. It is hard to believe you can get bordeaux wines or this quality for under $20.00. This chateau has consistently shined in tastings throughout the years and yet surprisingly has kept their prices low. With the dollars ongoing fall, who knows how long this can continue. I have to thank Ed Sands from Calvery Woodley in DC for the invitation to this lovely dinner and tasting. He consistently sponsors some of the better wine dinners in DC. More impressively, he usually does it with a all-inclusive cost below $100. Thank you Ed Sands, Michael Sands and William Holby for your wonderful dinners. Please keep up the good work! I will give Calvert Woodley a plug here. They have the Chateau Caronne Ste. Gemme on sale this week. It is a great time to pick up some 2003 and 2005 bordeaux at a killer price. The 2003 is on special at $17.99 and th 2005 at $21.29. Calvert Woodley is located at 4339 Connecticut Avene, NW in Washington DC. They have a fabulous newsletter via e-mail that you can sign up for at their website. Go to my favorite links section, or click the following link to sign up. I have been peppered with e-mail from wine lovers looking for a cheap, tasty everyday red under $15. I am not sure if all of them understand that quest for this type of wine is what we ALL look for everyday. Marietta Cellars has been around a long time. They produce some world-class wines and have a gift for blending different varietals with wonderful results. The "Old Vine" is non-vintage. It may be a blend of juice and/or wine of different years to produce a consistent flavor profile expected from the public. Instead of attaching a vintage year to each bottle, Marietta assigns a lot number. This years lot number is #45. It is a mix of Zin, Petite Sirah, Carignane, Cab, Alicante and some Italian varietals. It is ruby in color, a bit lighter then a good Zin. It is full of blackberry and Brier fruit on the nose. When tasting, it offers multiple layers of flavor. Brier fruits, spice and a bit of pepper on the finish balance the sweet mouth filling fruit. It is a tad on the sweet side, but not overly so. It is a great everyday bottle of wine, and easy to quaff. It is so hard to find a wine in this price range that does not is some way disappoint. Pick some up for dinner, grilling, cheese....anything your heart desires. For $11ish a bottle....what do you have to lose? I am attending a Bordeaux tasting at La Chaumiere in Georgetown, D.C. with some friends tonight. I will try to report on what we tasted sometime this weekend. Until then, Cheers! My wife Nancy simply loves "Black Salt". I have had some good meals there, but since I am a steak and potatoes type, it was never at the top of my list. This past weekend we dined with two other neighborhood foodies and decided to try the Chef's Tasting menu. All of us were quite pleased. Although not cheap...the $85 per person was well worth the money. Actually, in discussing the experience with the group, we decided it was probably a better value then a la carte. The chef welcomed us to the table with a gratis starter. A beautiful oyster topped with a dollop of domestic caviar. The oyster was fat, sweet and flavorful. The flavor of the fresh brine liquor was bumped to the next level with the addition of black caviar roe. A wonderful way to start the dinner. The hamachi was served sashimi style with the kim chee and micro basil on top. A great pairing, the kim chee was deliciously tart and sweet which was a perfect partner for the fish. Perfection. The scallops were chopped in small cubes with a dollop of avocado on top then sprinkled with crispy onions. The Vin Cotto blended perfectly with the briney scallop and the avocado gave a rich creamy texture to each bite. The onions provided the crisp texture and rich flavor. So much going on in this course. It was my favorite of the night. This was a beautiful presentation. The baby octopus was grilled tender and really picked up the wood smoke flavor. The black eyed peas were cooked aldente along with the saffron cauliflower. A delicious combination of texture, color and flavor. This is one I would have never ordered a la carte, but was a true winner. Boy, I love foie gras. Eel is not something I care for...but Unagi....fabulous. Unagi is richly textured like pate and creamy like foie gras. If I did not know in advance it was eel, I would have never been able to guess. I would have thought pate, or maybe a different preparation of foie gras. It was wonderful. The sweet cherry soy reduction was a perfect foil for the high fat in the dish. Not overly sweet, it complemented instead of overwhelmed. This was a perfect 10. This was a great idea, but did not knock my socks off. The meat was flavorful and rich, although a bit dry. The farro and pancetta jus was delicious...the red grapes were a flavorful and creative touch. Good, but if I had to order again, I would get the Big-Eye Tuna or Pacific Butterfish. twist on dessert at Black Salt, is they used Maple Syrup to sweeten and impart flavour to the pudding, and then topped it with home made maple walnut ice cream. The pudding was dense, rich and flavorful. To be honest, I was stuffed at this point. The maple flavour really came through in this dish. The cornmeal was infused with vanilla, cream, butter....all the wonderful things a baker has at their fingertips when making a delicious dessert. The maple walnut ice cream was delicious. Although I left much of the pudding, there was not a drop of the ice cream remaining in the bowl.If you are still hungry after the first five course...consider the pudding. If you are not...go for the fresh ice cream. Overall, the experience was wonderful. The waiter and staff were very attentive. The wine list is one of my favorites in DC, and the prices for wine are reasonable. I can't wait to go back. Don't hesitate to book this restaurant for your next special night. 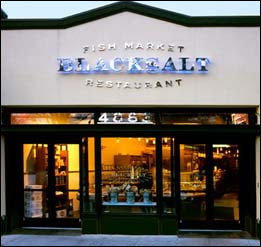 Last week I did the Chef's Tasting at "Black Salt" in Washington, D.C. I was very impressed with the wine list there. It was clearly put together by someone that had a passion for wine. There were many blends, esoteric varietals and lesser known vineyards..all of good quality. Neyers produces some wonderful wines. Most are highly rated, and all are reasonably priced for their quality. This vineyard has vines that are over 110 years old. Rich Pato oversees this plot and painstakingly tends to the vines. Most vines are not irrigated, so the low yeilding crop is rich with flavour. The grapes are hand picked, crushed and left in contact with the grape skins for 30 days before further fermentation. The wine pours lighter then I expected. Only a medium red to ruby color, this wine smells like stewed fruit, red berries and a bit of spice and pepper. It tastes wonderful. Lots of fruit up front. Berries, red and black with a bit of tart cranberry too. It has a rich sweetness to the fruit. It is mouth filling and satisfying. I was thrilled. Many zins can border on sweet and have a syrupy cloying finish. . Many are high in alcohol and will burn on the finish. This wine, although 15.5% alcohol, has a long balanced finish and avoids cloying sweetness. I loved it. 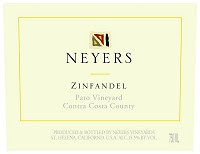 If you have a chance to try some of Neyer's wines you will be pleased you did. Although not cheap, I still say this wine is a good value. This wine is not stocked everywhere. Call ahead to your favorite wine store to see if they carry it. If you want to buy it On-line, try Binny's Beverage Depot They carry this for $29.99 per bottle or $28.49 by the case. ENJOY! When I was asked to review this wine I flashed a big smile. I cut my teeth on Cousino Macul twenty years ago. It was Chilean and cheap. Although I did not taste the Chardonnay, the Cab and Merlot were a fantastic value. Chile has become one of the best producers of wine in South America. Many of the large wine conglomerates have purchased land and developed vineyards there. There is a vast brain trust of winemakers that are sending lots of money and technology there to make wine. Many experts say it is "smart money". I tend to agree. Chardonnay is not a grape that shines in Chile. I am not sure if it is the terrior or the technology...but it is tough to find a good chardonnay from the region. This wine is the needle in the haystack. It is surprisingly good, and for the money, it is a steal. All of you that write to complain about the price of a good chardonnay take note. For less then $15 you can drink a wine that will outperform wines $25 and more. It is straw colored and pours cleanly. The nose is pear, citrus, apple, white flowers and a bit of toast. Although aged in oak, this is not an oaky chardonnay. The flavor of apple,pear and grapefruit are nicely balanced. The finish reveals a whiff of oak, but wonderfully integrated and balanced. This balance is rare in a wine in this price range. Cousino Macul is no longer an up and comer. They are one of the leaders of the Chilean wine industry, and have proven their value. Their premium wines are classified as "Antiguas Reservas". It is well worth the few dollars more to buy this reserve wine. Don't skimp in this price range. The winners are few and far between. This wine is a winner and available everywhere. Go out and try a bottle. Let me know if you agree. I bought this wine last fall on the recommendation of Doug Rosen at ARROWINE in Arlington, VA. He bought a few pallets, and sold it at a blow out price. I bought a case and stocked it in the cellar to let it rest a bit. There are positive and negative attributes to having a cellar. The positive part is you have a dedicated space to store your wine in a controlled environment. The negative is you can sometimes forget what you have in the racks at any given moment. I found this wine hidden away while making room for some wine that was being delivered today, and decided to take a bottle upstairs to try. Parker gave this wine 92 points. In all candor, that is the reason I bought a case of this wine. At $15.99 a bottle on sale, and 92 points....it seemed like a good deal. I like Australian Shiraz, and this certainly hit a sweet price point. The wine is very purple. Think Welch's grape juice purple. The aroma was sweet, heavy with black cherry, plum and blue fruits. It did not disappoint. There were no surprises on the flavor side. Lots of Blueberry with cherry and blueberry undertones. It has a big mouth feel, the fruit is almost overwhelming (Not that there is anything wrong with that...Thanks, Jerry Seinfeld). It finished smooth without any bitterness or heavy tannins. This is a very pleasant wine. I know that Parker gave it a 92, but remember this is a Australian Shiraz. If you do not appreciate the fruit forward style of the Australian winemakers, you will not care for this wine at all. If you do, as I do, you will appreciate this for what it is. A great Australian value. I am attending a Bordeaux tasting with some friends tonight which I will report on this weekend. Until then, Cheers! Every once in a while, I am asked to taste a wine and post a review. Being politically correct, some of the reviews don't make it to print if the wine doesn't perform. Over the years, there are very few that I just could not stomach. I see merit in most wines, without regard to price. I see it as a matter of value. My friend Brian Pawsat sent this wine over to me to review. I can tell you in advance, that ALL wine tastes better when free....this fact aside, here is what I found. It seems that most Australian wines these days have a gimmick label. With competition fierce, and prices low, anything the producers can do to grab attention, they do. This bottle label was stamped with postmarks to complement the "Dead Letter Office" theme. Cute, attractive and certainly attention grabbing. It also has a screw top, which seems more and more common these days with Australian wines under $20. For me, the screw top is actually an attractive feature. Although controversial, screw tops are perfect for everyday wines where you are only drinking a few glasses and resealing. It also alleviates having to worry about a bottle being "corked" or needing to carry a corkscrew on a picnic. I think you will see more and more screw top closures. I have good information that even the French Bordeaux producers are bottling some of their wine in screw tops to determine the viability for upper end, expensive Bordeaux wines. I say bring it on.....although there is something nice about the custom of uncorking as we know it. This wine is 98% Shiraz (Syrah) with 2% Cabernet Sauvignon. It is deep purple, almost black....like a bowl of blackberry jam. The nose reveals Black fruit, blueberry, vanilla and pencil lead. The wine looks thick and jammy, and certainly is inviting, especially to those of us who appreciate a "fruit bomb" now and then. The wine is certainly jammy. Lots of blackberry, blueberry, with a tinge of smokiness on the finish. The wine is thinner then I anticipated...not much glycerin or roundness. It is a big wine, but is well integrated. An easy wine to quaff, you have to be careful not to polish off the bottle with dinner.... It is 15% alcohol which will certainly disable you the following morning. For the money, this is a great value. It can be found locally retail for less then $25.00. If you are willing to go on line, it is available at $16.00 per bottle. This is exactly as I describe, a fruit bomb. If this is your thing, you will love this wine. If you are a purist and want something more complex....move on to the next review. Thanks Brian, for bringing this one to my attention. As I mentioned earlier in the review.....when the wine is free....it always tastes better... Cheers! Have you ever a tried white Chateauneuf du Pape? Or, as the French say Chateauneuf du Pape Blanc..... No?... Well, expand your horizons. You are missing out on a wonderful wine experience. I must say, this is not a wine I would normally order. Especially so at a restaurant, offered at 3 times retail. My wife and I went out to dinner this Saturday at Washington's "Black Salt" with 2 other couples that are friends and neighbors (Review to follow later this week). We wanted to start with a white, and this Chateauneuf du Pape caught my eye. What the hell. We were having the tasting menu and spending a fortune, why not splurge. What a good decision it was to try this wine. Although this is a blend of grapes, it is not the typical white melange that you find in many white meritage. Most tend to be a bit sweet, reflecting the Viogner and Marsanne in the blend. This wine is 40% Clairette, 40% Bourbulenc, 10% White Grenache and 10% Roussanne which yields a nicely balanced, dry white. Although there is certainly residual sweetness....it is not at all cloying. The acidity is a perfect foil to the sweetness.....beautifully balanced. The wine is pale and straw colored. When poured it is a bit unctuous and really clings to the bowl of the glass. The nose is all honey and white flowers...very pretty and delicate. It almost tastes un-oaked....nice fruit, great balance and no bitterness from tannins. This one did not last long at our table. This wine does have great structure, and seems like it would develop in the bottle for a few years if you can keep yourself from drinking it. It will certainly be worth the effort to find it as an addition to your cellar. Usually, when I find a wine I like, it is easy to research it on-line. This wine, although showing up on many restaurant wine lists in the DC area, did not give me any local retailers for this beautiful white. I was finally able to find it on-line at a retailer in Michigan. This wine was featured at $60 on the wine list at "Black Salt". This is not cheap for a white wine. As a rule of thumb one can usually divide the wine list price by two to find a local retail price, and by three if you are willing to buy on-line. This one is offered on-line at WineBuys.com for $19.99 per bottle. I will tell you....it is worth every penny. I went to Morton's Steakhouse last night with a group of like minded wine lovers. We usually get together beforehand and open a few bottles of wine to catch up on each others lives, and compare notes. I had a few very interesting wines that I am sure to review over the next few weeks. Morton's is having a special nationwide that I feel is a good deal. Two meals...Fillet, Scallops or crab cake, side veggies and dessert....all for $99. Although the wines there are decent...they mark up the wines three times retail...so there are certainly no bargains. We tried to stick to the $60 range where we found this gem of a wine. I was introduced to Jade Mountain by my friend Gus Kalaris and his wife Lynn. They own CONSTANTINE WINES, a large distributor in the Washington, DC area. 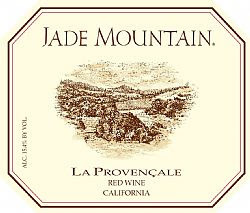 Jade Mountain is known for producing French varietals and blends grown in various counties surrounding Napa in California. When I saw La Provencale on the wine list, I had to order it. This is a blend of five varietals, the primary grape is Mouvedre. It also features Syrah, Granache, Carignane and Viognier. All of these are classic grapes blended to make Chateauneuf du Pape in the Rhone region of France. Jade Mountain (Now owned by multi-national conglomerate Diageo) was way ahead of the times producing these varieties in California, and it shows. The wine poured a lighter color then I anticipated. It looked more like a Pinot Noir then a Syrah blend. The aroma was fabulous. Raspberries and red fruit, spice, clove and a bit of vanilla. Very nice start. The wine is very lush and fruit forward. Raspberry and plum are the main components. Tannins are smooth but balances. There is a bit of a burn on the end...but not unpleasant. Turns out this wine is over 14% alcohol. Overall, it was a very nice choice. Was it worth $60? Not even close. This morning when researching I was pleasantly surprised to find it many places at under $20. On line, you can find it for $14. At that price...this is a great value. Those of you that enjoy blends, smooth drinking reds and great values, look no further.